In July ’10, I purchased an EPIC View 550 Treadmill. Within 3 weeks the product demonstrated slipping and gripping problems with the tread. Followed instructions to fix found in manual– no success. I called EPIC and was holding for over an hour!! It took an additional two weeks, 3 repair visits, 2 new parts (one was back-ordered…hmm?) and what felt like hundreds of individual calls to EPIC’s customer service department before I THOUGHT it was operational again. Within 20 minutes of my workout, the same problem of gripping and slipping began. VERY VERY UNSAFE when running at a good pace I might add. I called EPIC again, put in the service request and asked to have a supervisor call me. I’m thinking I have a lemon and I need reassurances. I was told the supervisor would call me the same day, as well as the repair company. IT TOOK A WEEK TO HEAR FROM A SUPERVISOR AND 4-5 DAYS TO HEAR FROM THE REPAIR COMPANY. The supervisor refused to give full name for my records, citing security reasons. BUYER BEWARE “CUSTOMER CARE” IS OF ZERO CONCERN TO EPIC AND ICON FITNESS. I don’t know if it's laziness, unprofessionalism, or sheer incompetence, but pray you don’t have to deal with these people. It is September ’10, and I still have a 500 pound paper weight in the basement, STILL UNDER THE MANUFACTURES' WARRANTY!! If you unfortunately have to call, this number gets you to a representative faster. 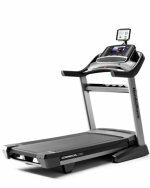 I am 3 months outside the warranty on this treadmill which is basically a NordicTrack--been looking at a Sears NordicTrack on sale but it appears I might be in the same boat--assessing the cause itself starts at $139 a shot or more--at some point it seems like it might not be worth it. 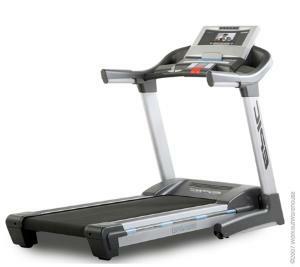 I have had this treadmill and have had the same problem with it gripping and slipping--if I leave it on 0 mph it will start itself and go as long as it can up to 100 minutes--it turns itself on and runs the treadmnill--I have to make sure it is unplugged. Now, I pulled up the treadmill to stand it up so I can clean underneath and I cannot get it back down--it is stuck in storage position. I have called the number and never gotten a real person--I have been on hold for up to an hour or more. I think it has a problem with the motor and all the other parts--I cannot even use it right now as it is in storage mode and won't come down--it is more of a sculpture than a treadmill and I am considering buying a Precor like my old 20 year old one that never gave me a problem. This is a huge waste of money--and I will have to pay someone to move it to the trash! I bought it at Sams about a year and a half ago, and it is well past their warranty. I hate spending good money to get worthless junk. I am going to put this up on Twitter for a broader readership. Our Epic T40 treadmill has, so far, performed well. My wife and I have over 600 miles and 145 hours on this machine, so it's beyond any "Honeymoon" phase. It is truly made for running. Most Icon Health and fitness treadmills don't meet this requirement. As of this moment, the Epic T40 hasn't required any adjustments to the belt, such as tension or alignment. My first treadmill (a Proform) started slipping after about 50 miles. I junked it shortly after one major repair attempt at around 100 miles. I did have one problem with the Epic T40. After about 3 weeks of inactivity, the treadmill wouldn't start. I simply unplugged it, waited a few minutes, and plugged it back in. We haven't had any problems with our Epic treadmill since. Pros: Solid construction, built-in TV (analog), large running surface, commercial-grade 3.5 continuous HP motor. Cons: Requires digital converter to watch TV, use it or lose it (binds up after inactivity). My sons bought an Epic TL 1700 treadmill for a Christmas present for me. I am 66, weigh about 125 lbs and use it 3-5 times a week. It quit after 6 months. I called ICON customer service and they sent me a long email and told me a service company would contact me in 3-5 days. After a week, I contacted them again. Then I read my agreement that I had a year's warranty on parts but not labor. The service company that was supposed to call was over a hundred miles away. I emailed to see what their service call would be, but still haven't heard from them. My husband finally spent over 3 hours and got the treadmill repaired, for now. I would not recommend purchasing the Epic TL 1700, even though it cost around $800, it still should have lasted longer without a repair.